Sharks Bay Is one of the 5 sandy beaches of Sharm El Sheikh, has it's private jetty for diving boats and water sports, diving center, fish restaurants, beach cafe, and beach front resorts and residential area with an amazing sea view, great location for families, surrounded with 5 Stars Hotels like: Four Seasons, Hyatt Regency, Pyramisa, Concorde El Salam. 7 Minutes to Naama Bay. 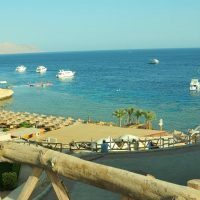 5 Minutes to the International Sharm El Sheikh Airport. 10 Minutes to Nabq Bay. 2 Minutes to the famous Soho Square with all the nice restaurants and shops.